Did you know that rose hips contain more Vitamin C than any other fruit or vegetable? The rose hips are that big seed pod that forms on rose canes after it blossoms. Some roses, especially Rugosa roses, form rose hips that are as big as a quarter! I recently learned that roses are actually a member of the apple family. Pick ripe rose hips after the first frost in the fall when they’ve turned bright orange or red. Trim off the stem and blossom ends, cut the hips in half and remove the seeds and wash well. Boil them for tea, dry them for sprinkling on cereal, make syrup for pancakes, put them in your juicer with apples for a vitamin C rush…the possibilities are endless! Rose petals are also edible, just avoid the ones that have been sprayed with pesticides. They are used in cakes, muffins, tea, jams, candy, and salads. I learned that George Washington bred roses at his home. Ronald Regan, along with his wife, both have hybrid tea roses named after them. Two more ex-Presidents John F. Kennedy, and Abraham Lincoln also have roses named for them. Even more celebrities have roses named for them including: Bing Crosby, Bob Hope, Audrey Hepburn, Marilyn Monroe, Elizabeth Taylor, Carmen Miranda, Lucille Ball, Eva Gabor, and Ingrid Bergman, Julia Child, Barbara Streisand, and many more. I read that anyone can have a roses named for them for a price tag of about $15,000 dollars. The oldest living rose bush, which is now the size of tree, grows against a cathedral in Hildesheim, Germany. Documentation proves it has been there since A.D. 815. Hard to believe that this rose has flourished for over 1000 years! A fossilized rose was found in Florissant, Colorado and is believed to be 35 million years old. It was imprinted on a slate deposit. It has been reported that the worlds largest single rose bush lives in Tombstone, Arizona at the Rose Tree Inn. Commonly called the Lady Banks, it is a white rose that came from Scotland in 1885. It covers over 8000 square feet and blooms in the early spring. For a fee you can view it, picnic by it, or get married around it. You can also buy a rooted stalk and take home some history! The colors of roses given to loved ones are thought to project different meanings. Red Roses – Love. They convey deep emotions from respect to devotion. White Roses – Chastity and innocence. Pink Roses – Gentle emotions, joy, gratitude and appreciation. Orange Roses – Togetherness, passion and energy. Peach Roses – Anticipation and hope for the future. Purple Roses – Light shades – Love at first sight. Darker shades – Splendor and regal majesty. Yellow Roses – Exuberance, friendship and caring. 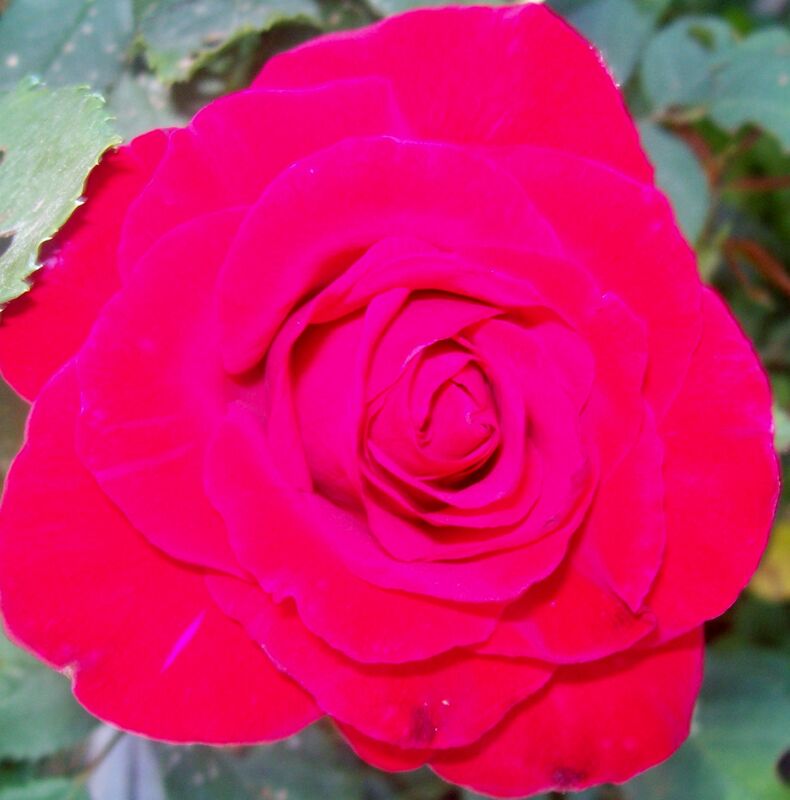 Roses are widely used in Ayurveda medicine for everything from a liver tonic, to numbness in the hands and feet. Caring for roses mostly consists of deadheading. Dead-heading is the removal of faded flowers before they can develop seed. It is a form of summer or day-to-day pruning. The standard recommendation is to cut the flower stem back to an outward-facing bud above a five-leaflet or seven-leaflet leaf. The majority of pruning is done in the spring. Many rose growers suggest waiting until the forsythias start to bloom as a good signal for the pruning season to begin. Use clean, sharp equipment. Cut at a 45-degree angle about 1/4 inch above outward-facing bud. Entirely remove all dead or dying canes and remove all thin, weak canes. As far as I can tell, there are 7 types of roses. Floribunda, hybrid tea, grand flora, shrub and landscape, climber, miniature, and tree roses. Roses sometimes suffer from black-spot, powdery mildew, and many pest problems. I have not found a natural tried and true method for curing these problems. I pick beetles off by hand in the early morning hours, and have tried spraying the roses with a soapy water solution, but this does not seem to do the trick. I would greatly appreciate suggestions! Roses are also widely used in the beauty industry. There are many products ranging from soaps and body oils to fragrances with rose water. Here is a recipe for simple rose oil. Put freshly picked rose petals in ½ cup extra virgin olive oil. Use a sterilized glass jar. Lightly swirl and let stand in a dark place for 24 hours. Strain with cheesecloth and repeat with fresh petals. It will take about a week for a nice scent. Then just add a couple of drops of glycerin and pour into a dark colored bottle. Posted by Createityourself on May 21, 2012 in Cooking and Baking, Natural Medicine, Plants and Gardening, Project Center and tagged deadheading, gardening, pruning, rose facts, rose hips, rose oil, rose water, roses, tea, vitamin C.
Fantastic post I had no idea about any of this! I thoroughly enjoyed that lesson, who knew roses were that interesting? Thanks for the comment! I have been learning about roses all week! So many things I didn’t know about roses. Thanks for the great blog! If I am ever in AZ I want to stop by Tombstone and get a piece of history! Me too! Thanks for the comment! What a wonderful post. I actually have a rose bed dedicated to roses named for the Presidents and First Ladies: Ronald Reagan, Lady Bird, Mr. Lincoln and Barbara Bush. Strange bedfellows indeed… Ha! Did you know that the Rose was named herb of the year for 2012? Thanks again…. I did not know that! Thanks so much for the comment! i will have to save this permanantly. so much good info ! now i know to buy a mixed variety of roses to show all the many feelings i am trying to exspress! thank you.